I am selling my Devinci Dixon XP 2012 medium frame. The bike is in great condition, nothing have to be done on it. No scratch on the bike. Spec: FORK: RockShox Revelation RL Dual Air 150mm REAR SHOCK: Rock Shox Monarch RT HV Front and rear brake: Avid Elixir 3 Front and rear derailleur: SRAM X.7 CRANKSET: SRAM S1000 38/24T Also the bike as been customize with a rock shox reverb seat post, chain guide X guide Truvativ and Schamlbe Hans Dampf tires. Note: I keep the pedals the bike is not selling with it. Je parle français. 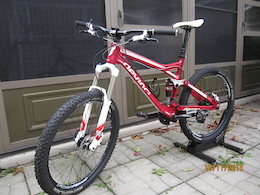 I am selling my Devinci Wilson XP carbone frame medium.. The bike is in a great shape, it as been riden only 6 times. I buy the bike new in the beginning of the year. 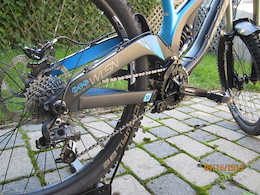 derailleur sram 7 brake elixir 5 forch rock shox RC200mm wheel jalco DD30 For bike complete spec: http://2015.devinci.com/bikes/bike_622_scategory_151 Reason for sell: at 41 years old, i am not going to ride DH anymore. Je parle francais.